The sands of Tatooine are full of dangers. Tusken Raiders prey on moisture farmers, Jawas scavenge or filch whatever isn’t tied down, and enormous krayt dragons terrorize every smaller lifeform. And if that weren’t enough, a small Imperial garrison is charged with keeping brutal order on Tatooine, even though the entire planet is firmly in the grasp of the crime lord, Jabba the Hutt. It’s the perfect place for danger and iniquity to take root. 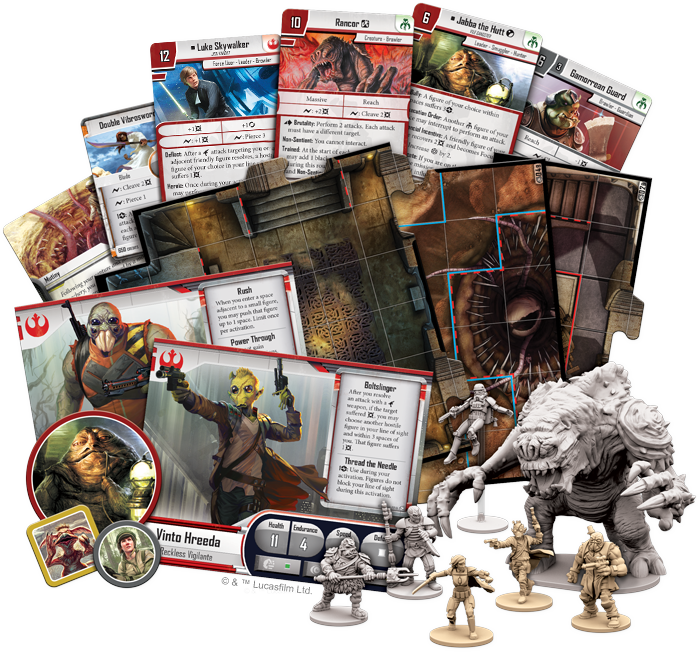 Today, we’ll walk into Imperial bases and underworld dens to search out the new figures and tactics that the Jabba’s Realm expansion introduces to your games of Imperial Assault! Jabba the Hutt keeps dozens of beings on his payroll as members of his criminal empire. Some are his guards, while others are the desperadoes and enforcers who stretch Jabba’s power far beyond the walls of his palace. The Weequay Pirates undoubtedly fall into the latter group. As skilled raiders, the Weequay Pirates are some of Jabba’s preferred foot soldiers outside of his sprawling palace. With two green dice and a built-in accuracy boost, these figures can strike at range with little difficulty, and the Raider ability makes them even more dangerous—while a Weequay Pirate is attacking, you can choose any die and force its owner to reroll it. Whether you reroll an attack die or a defense die, Raider gives you an excellent way to increase the amount of damage you deal with every attack. 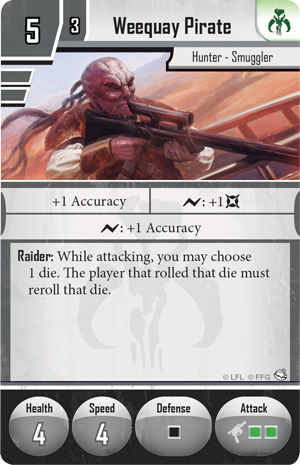 You may also choose to field more experienced raiders with the elite version of the Weequay Pirates. This figure group costs two more points, but it offers significant benefits. Every figure benefits from increased health, the Pirates’ inherent accuracy boost becomes larger, and every surge ability is much more potent, allowing you to deal more damage, increase your accuracy, and pierce armor. 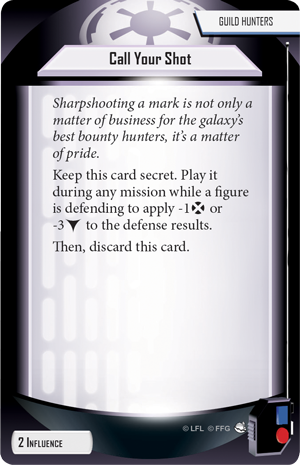 They also gain the Prowl ability, spending an action to become Hidden and avoid many of the ranged attacks that would come their way. Within Jabba’s Palace itself, you may choose to employ some more brutish warriors, such as the Gamorrean Guards. These melee fighters feature one of the most dangerous attacks in the game, with two red dice and the ability to cleave damage onto an adjacent figure. What’s more, the Reach keyword lets their attacks extend beyond adjacent spaces, commanding a wider area of the battlefield in every scenario. 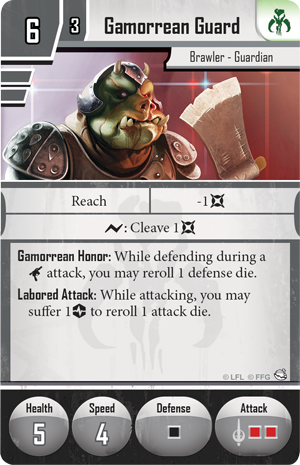 Combine that with Labored Attack, which allows them to suffer a strain in order to reroll an attack die, and Gamorrean Honor, which lets you reroll a defense die while defending against a ranged attack, and your Gamorrean Guards will be able to cut a swath through any party of Rebels. You may even hire the elite Gamorrean Guards to smash through your opponents’ heroes. Elite Gamorrean Guards are even more powerful than their normal counterparts. They can cleave more damage, and their abilities become more predictable, allowing you to rely on staying alive and dealing damage over multiple turns. If you’ve secretly paid off some of the Imperial officers on Tatooine to help with your schemes, you may also take advantage of the new Jet Troopers introduced in Jabba’s Realm. Jet Troopers are fragile, but the Mobile keyword allows them to move quickly over terrain that would slow down other Imperial forces. What's more, these Jet Troopers’ agility allows them to convert a single block into an evade result, potentially canceling a surge your opponent needed to hit you at all. 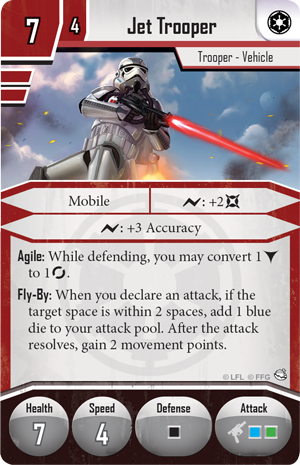 In addition, these Jet Troopers can blast off after attacking a nearby target, gaining another movement point to help them dart away before your opponent responds. Not many Imperial troopers have received extensive training with jetpacks, but those who have can be powerful combatants, flitting across the battlefield and quickly striking before they retreat to safety. Elite Jet Troopers benefit from higher health and better surge abilities, while the Jets ability has been replaced with Fly-By. Fly-By not only allows you to move farther after you attack, getting away from a potential counterattack, it adds a blue die to your attack, making your attacks even more likely to deal damage and defeat the enemy. The final figure that may fight alongside your Mercenaries in this expansion is none other than Jabba’s legendary Rancor—a towering, monstrous creature, perfectly capable of tearing any foe to pieces. In the campaign, the Rancor is a terrifying foe, nearly impossible to bring down. Its attacks can deal a massive amount of damage, and you can spend surges to spread even more damage onto the battlefield. You can throw enemy figures, moving the heroes and keeping them away from their objectives. Or, you may allow your Rancor to feed on your own allies, defeating a friendly figure in order to recover damage equal to that figure’s remaining health. 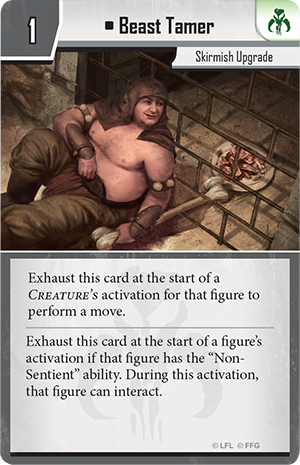 The Rancor feeds on a nearby Gamorrean Guard, recovering two points of damage at the beginning of its activation! 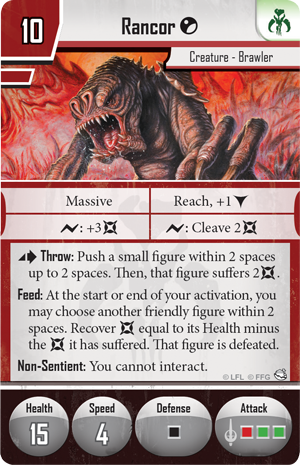 The Rancor is no less terrifying in the skirmish game, though many of its abilities have changed. 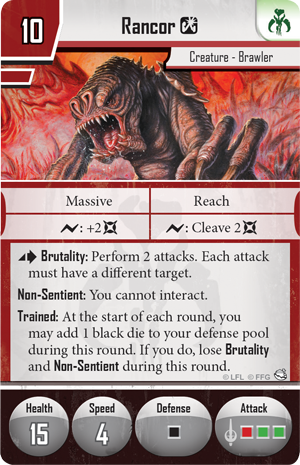 Now, the Rancor can spend an action triggering Brutality to attack two different targets. 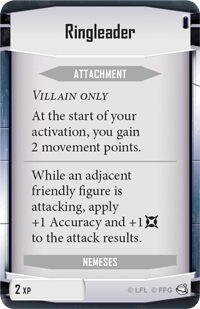 These vicious attacks can be crucial to victory, but if you need to control an area instead, you can use Trained. 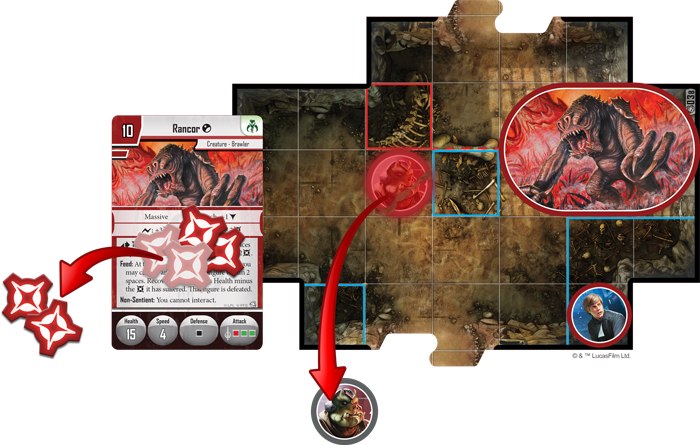 Trained adds an extra black die to the Rancor’s defense dice and it loses the Brutality and Non-Sentient abilities. Though you won’t deal quite as much damage at once, you’ll suffer much less damage and you’ll be able to interact with mission objectives. You may even combine the Rancor with the Beast Tamer skirmish upgrade to give it extra movement and allow it to interact without losing its brutal attacks. Although the new figures joining the Imperials and Mercenaries in Jabba’s Realm are impressive enough, they’re just the beginning of the new tools for the servants of the dark side. You’ll also find two new Agenda sets and two new Imperial Classes giving you new options to explore in any campaign! With the new Agenda cards from Jabba’s Realm, you’ll be able to surprise the Rebels with a nasty ambush when they least suspect it. For instance, you may play Call Your Shot when an enemy figure is defending to subtract a dodge or three blocks from the defense results! Or, you may play Shoot First at the start of a round, giving one of your Imperial groups the chance to activate before any Rebel hero moves. You may even play Jetpacks when you deploy a group of figures, giving them Mobile and the ability to race across any battlefield. The first Imperial Class in this expansion puts a dramatically different spin on your campaign by inviting you to focus on the saga’s most iconic villains. The class starts with Powerful Foes, allowing you to automatically earn an Imperial villain and a Mercenary villain of your choice. 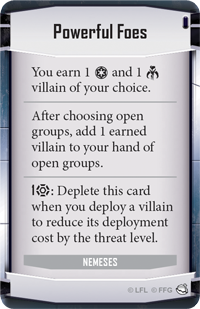 Then, you can bring those villains into any mission, and even reduce their deployment cost as you move further into the campaign. Your villains also become more and more dangerous as you advancer further in this class. Ringleader gives your villain more movement and gives them an aura of menace that inspires nearby figures. Then, with Indomitable, you keep your villains from gaining Harmful conditions and improve their defenses, ensuring they’ll have an even greater impact on the battlefield. Conversely, the Hutt Mercenaries Imperial Class invites you to put bounties on the heroes and hunt them down relentlessly. 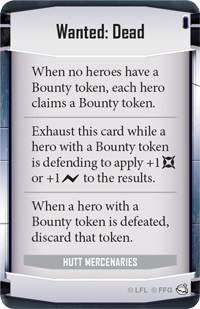 This class begins with Wanted: Dead, a card which forces each hero to gain a Bounty token. 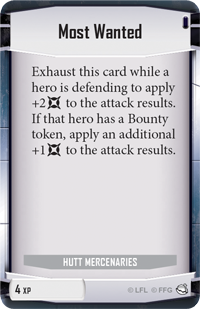 Then, you can exhaust this card when attacking a hero with a Bounty token to boost your damage or gain more surges. 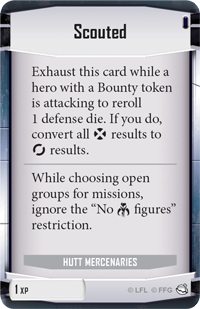 Scouted cancels all dodges from a hero with a Bounty token and brings your Mercenaries into any mission, even if they were normally restricted. You may even use Most Wanted to massively increase the damage you deal to a single hero, bringing your targets in quicker than ever. The sands of Tatooine may be devoid of valuable resources, but that doesn’t mean it’s not the perfect place to build your own criminal empire. 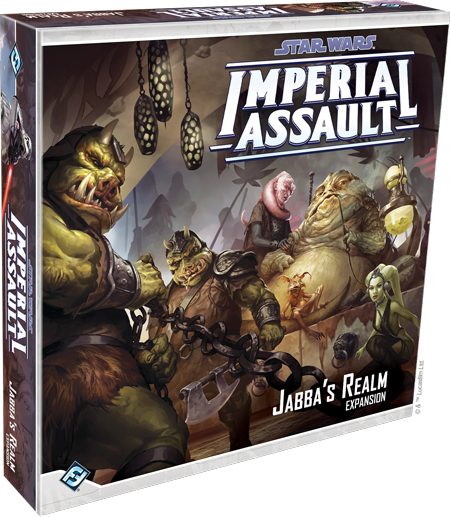 Start building your armies for the campaign or skirmish games and pre-order your copy of Jabba’s Realm at your local retailer today!